I made a family favorite the other night, Amish Casserole. I would strongly suggest covering this casserole for at least half of the time it spends in the oven. I found that mine turned out too dry if it wasn't covered. Recently I have enjoyed putting shredded cheddar on top of the casserole, which you can add the last 10 to 20 minutes that it is baking. 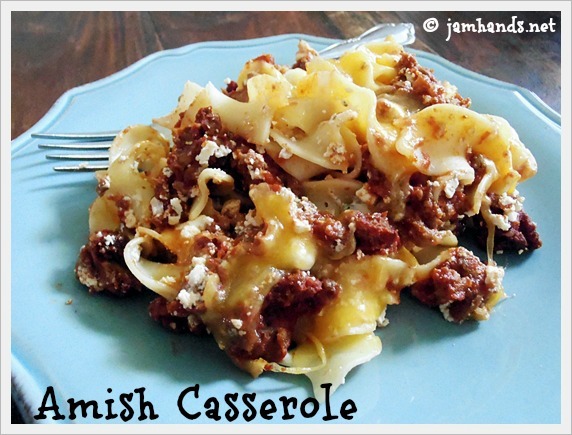 I love, love, love this casserole. My mom made it growing up so it just makes me feel comforted. Enjoy! Notes: Pizza sauce is a mixture of tomato paste and tomato sauce with a bit of oregano and garlic. You can make your own, or simply use plain tomato sauce in this recipe and add a little extra seasoning. In a small mixing bowl, combine the sour cream, cottage cheese, onion, and parsley; set aside. In a large saucepan, cook the noodles according to the package directions. Drain and set aside. Heat the oil in a large saute pan, over medium heat, and add the ground beef, stirring now and then until the meat is no longer pink. Drain off all liquid and discard. Stir in the tomato paste, pizza sauce, basil, oregano, salt and pepper and simmer for 5 minutes. Preheat the oven to 325-f degrees. Grease a 9 x 13-inch pan and begin layering as follows: one-third of the meat sauce, one-half of the noodles, and one-half of the sour cream mixture. Repeat these layers, ending with the meat sauce. Bake covered for 1 hour or until the casserole is bubbly. If you would like, remove the cover the last 20 minutes of baking to crunch up the topping a bit. Allow to stand for 15 minutes, then serve. Adapted from a recipe from a fantastic cookbook that you should buy immediately, New Recipes from Quilt Country: More Food & Folkways from the Amish & Mennonites. This looks really similar to a St. Louis classic I posted a few weeks ago. When I first read the recipe I thought it sounded gross, but it was a childhood favourite of DH so I persevered and boy am I glad I did. YUM! This is going straight into my recipe box. My husband is part Pennsylvania-German, and he'll love this. Who doesn't love a good old fashioned casserole? This looks so yummy! I love the new look of your blog! I am also a follower, I would love it if you would stop by and look around my blog, and if you like what you see,I would love it you would follow back! This looks so delicious. I love a good noodle casserole and all of the ingredients sound amazing together! I'm originally from the Pennsylvania Dutch country and was drawn to the title. What a great recipe! Thanks so much! I would be honored if you would link up to my Commercial Break Thursday! 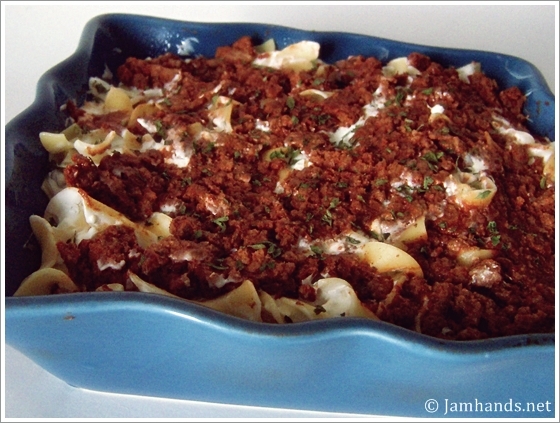 We just love a great casserole and your Amish Ground Beef and Noodle Casserole looks delicious! Hope you have a great week end and thanks for sharing with Full Plate Thursday! I'm hopping over from your link-up and this looks awesome! Pinned!!! I was about to make this, and was hoping you could clarify if I'm supposed to cook the noodles before I layer them in the casserole or not? Thanks! Sorry for the late reply. but to anyone else wondering, yes you cook the noodles first. Hi Mammamia - Sorry if anything was unclear. In the directions under step #1 it has you cook the noodles according to the package directions and drain. This looks so great. Thanks for linking up your recipes to my new Future Expat Required Ingredient Recipe link party. I think this is the first one I want to try! Congrats! This recipe was featured as one of the most popular recipes from last week's Future Expat Sunday Required Ingredient Recipe link party. I hope you'll come back and post to today's link party again...the theme this week is chicken. It is a recipe that I am going to do this weekend for a picnic dish. Thank you so much!! I made this, my family wouldn't eat it as it had way too much sour cream. It would be good with about 1/2 as much. Sorry to hear that Donna. Did you use the full 2 lbs of meat for it ? We love it the way it is, but tastes vary from one family to another. I absolutely hate cottage cheese! Is there a good substitution or can I leave it out? Recipe looks delicious otherwise. I read this recipe and immediately said ....gross! I love cottage cheese by itself or with tomato wedges. But mixing it with anything and especially cooking it turns my stomach. 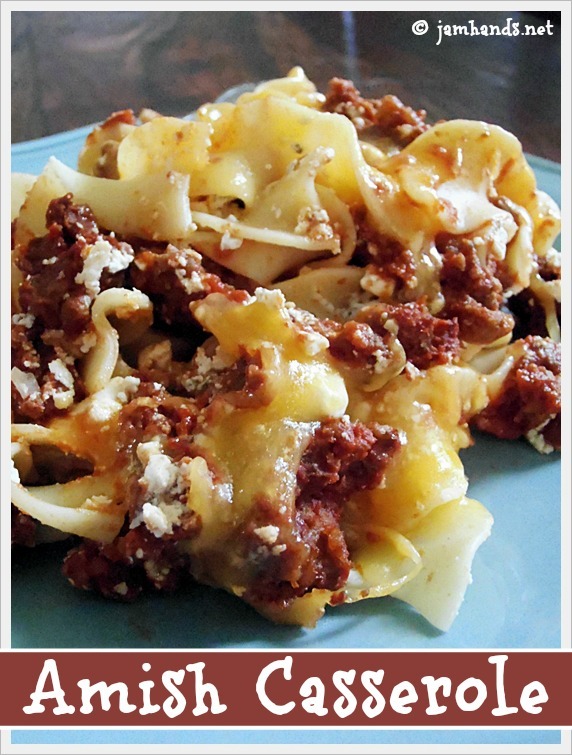 I won't even eat lasagna because most recipes call for cottage cheese. But I decided to give it a try knowing my husband would probably eat it .....well am I glad I did ! It was amazing! Just goes to show, you never know until you try it. Oh, and my husband liked it too....wants me to make it again! Definitely a keeper. Hah - well I'm glad to hear you liked it and you tried it even though you were skeptical :) Thanks for the feedbak! I'm sure you could sub. Ricotta cheese for the cottage cheese. Thank you Karen :) I hope your fam enjoys it. Is this a casserole that can be made ahead of time and frozen? I would really like tO know if the noodles should be cooked. I can't see anything about cooking the noodles first. ???? Hi Patty - It is in step one - In a large saucepan, cook the noodles according to the package directions. Drain and set aside. A dear friend in Pennsylvania made something very similar for me after a major surgery and brought it for dinner. She kindly included the recipe, and It has always been a favorite!! Now I bless others with this, homemade rolls, and a salad whenever I take a meal to someone. EVERYONE loves it!! Excellent! Glad to have a great new recipe. It is really good! Will this casserole freeze well before it is baked?